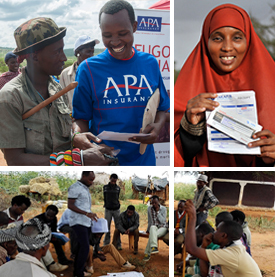 On 25 March 2014, one hundred and one pastoralists in Wajir town received compensation from their ‘sharia–compliant’ IBLI policy. The ceremony, which was hosted by Takaful Insurance of Africa and MercyCorps, received considerable media attention across a range of outlets, both national and international including the (BBC, Al-Jazeera, and The Economist to name a few). To see the full summary of all media attention received click here. The event was well attended by many of the key actors critical to helping us meet our objectives and achieve impact. A majority of the 30 women and 71 men eligible for payments were available to receive their due. Tags: MercyCorps, Takaful Insurance of Africa. Bookmark the permalink.